The London Philharmonic Orchestra, under the baton of Vladimir Jurowski, is currently in the midst of presenting Richard Wagner’s tetralogy Der Ring des Nibelungen over a three-year period. The first opera Das Rheingold was performed in January 2018, with the second Die Walküre appearing now. While in the initial instalment, the chief god Wotan manages to retain his status and magnificent castle Valhalla, albeit at a terrible price, in this one things unravel at an alarming rate for him. He is slightly fearful of the giant Fafner, who now possesses the ring that makes the bearer all powerful, but absolutely terrified of the dwarf Alberich who forged it from the Rhinegold and is determined to possess it once more. To combat the threat posed, he has taken several measures to fight back. On the one hand, he has fathered nine daughters, the Valkyrie, by the earth goddess Erda, and their job is to gather mortals who have died in battle in order to create an army of heroes to protect Valhalla. On the other, he has fathered a brother and sister, the Wälsing Siegmund and Sieglinde, by a mortal mother on earth, where he has also left a sword with powers he has given it for Siegmund to find. Wotan himself is bound not to try to retrieve the ring but hopes that Siegmund, as a free agent, will be able to do so. However, as his wife Fricka points out, Siegmund is not acting on his own if he is using a sword with godly protections. Wotan is therefore forced to remove them while instructing his favourite Valkyrie daughter Brünnhilde not to help Siegmund in the battle that is to take place between him and Sieglinde’s brutish husband Hunding. However, Siegmund and Sieglinde, despite being siblings, have fallen in love, with Sieglinde now bearing their child. When Brünnhilde tells Siegmund he must die but will go to Valhalla, which she still believes to be the greatest thing that could happen to a mortal, she is shocked to discover that he views Wotan with contempt for failing to protect him. He even goes so far as to say that he would rather descend to hell, and to kill Sieglinde so that he remains her sole protector, than serve such a despicable god. Brünnhilde is so moved to see his love for Sieglinde that she resolves that both will live as she will protect him in the battle. Wotan, however, moves to ensure that Siegmund is killed anyway, and is furious that Brünnhilde disobeyed him. She tries to pacify him by suggesting that she followed his true wishes rather than his orders, but he says that now she has chosen to side with the mortals he must leave her to them. He thus resolves to put her to sleep on a rock where she will wait for a man to awaken her. She pleads with him to put a ring of fire around it so that only the greatest hero could ever reach her and, after saying that she is in no position to ask for anything, he agrees because deep down he still loves her. Thus, while it may seem that Wotan carries out the cruellest act, the real tragedy is his and not Brünnhilde’s. Both the words and music reveal that there will be a new dawn for her with both characters knowing full well that her rescuer will be Sieglinde’s son (Siegfried, after whom the third opera is named). Wotan, on the other hand, knows that at the end of the act he will be exiting the stage in more ways than one. The world is no longer his to rule, and he must leave it to his offspring. Last year the LPO gave a performance of Das Rheingold that, judged as a beautiful and balanced rendering of a score, was extremely accomplished, but which did not always succeed in getting under the skin of Wagner’s intentions. Its performance of Die Walküre was on a different level, and in terms of the orchestral playing this has to rank as one of the finest performances of the opera that this reviewer has ever heard. It combined precision with feeling in a thrilling combination so that, for example, the famous ‘Ritt der Walküren’ revealed an array of colours and textures that do not always come to the fore. Sometimes the degree of focus seemed almost superhuman so that the close to Act II felt positively electric. 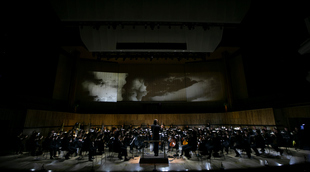 This concert performance also featured video projections, courtesy of Pierre Martin, that worked because they were used sparingly and not throughout the entire opera. At the start of Act I they were very effective as they portrayed moving ground as if someone were running across it. Coupled with the playing, which crisply captured all of the crescendos and diminuendos while conveying an overall sense of unrelenting movement, one could really picture Siegmund running at breakneck speed while also being weighed down by exhaustion. When the second motif was introduced lightning flashed across the screen as well so that both musically and visually we felt the clash of worlds that Siegmund finds himself caught between. All acts came in several minutes below the standard time and yet, while the playing felt extremely charged, it never felt rushed. Last year all of the singers performed from the choir stalls behind the orchestra, which presented them with a far larger space over which they had to project. This time some use was made of the stalls, but as a rule when a scene only involved two or three people they performed at the front of the stage. The stagecraft was highly effective, which can be attributed in large part to the talents of the performers. For example, when Ruxandra Donose’s Sieglinde described how the sword had been left in the tree, Stuart Skelton’s Siegmund took slow steps towards her as it grew clearer to him that he was the one destined to find it. At the point at which he reached her, however, they both faced outwards as they joined hands. In fact, the way in which this pair interacted was extremely powerful as he typically placed his arms on hers, and she her arms on his chest. It conveyed all of the love and passion that they felt for each other without pushing things to the degree that they probably would have been in a full staging. Another deeply moving moment came when Svetlana Sozdateleva’s Brünnhilde came to tell Siegmund he would die and that she was to take him to Valhalla. With both characters gazing outwards, their faces illuminated by Malcolm Rippeth’s lighting designs, we clearly saw Siegmund’s expressions as he thought to ask each of his questions as to precisely what this entailed. In this way, we could see how he was pleased to hear that he would see wish-maidens and other heroes, and moved to think how he would see his father, before his subsequent questions turned him around to such an extent that Brünnhilde ended up being won over to his way of thinking. The death of Siegmund was also rendered well with four of the characters positioned at the front of the stage and Wotan controlling everything with his spear from the choir stalls, even if some of the impact of the precise moment when Siegmund was slain was lost in this concert performance. The Valkyrie performed from the choir stalls with the way in which many of them slowly moved on (and off again at the end of the section) making them feel even more formidable. A few of their individual lines were sung through megaphones from virtually offstage, while the sight and sound of five of them facing outwards singing, while the orchestra was kept to levels that enabled them to be heard, made the encounter feel intimate in a way that staged performances rarely do. 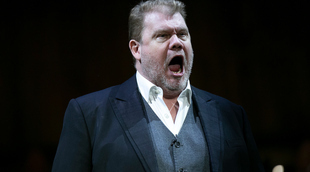 Stuart Skelton, who also played Siegmund for the Royal Opera last autumn, was outstanding with his exceptionally expansive tenor possessing infinite power and passion. Ruxandra Donose was also excellent as Sieglinde with her beautiful, rounded and nuanced voice conveying immense sensitivity while still projecting well. Stephen Milling brought his extremely rich, firm and authoritative bass to the fore in the role of Hunding while also matching Skelton for power. Svetlana Sozdateleva revealed an extremely sumptuous voice and brought a notably well shaped sound to the role of Brünnhilde, while Claudia Mahnke’s singing and acting perfectly captured Fricka’s pride and haughtiness on the one hand and sense of desperation on the other. Marcus Marquardt was a highly effective Wotan who sometimes felt just a little underpowered, but who knew exactly when to hit home with his voice and then did so in handsome fashion. Overall, he conveyed a great sense of ease with the part, and underwent the transition in Act III from furious chief god to loving and heart broken father well. Within this, the moment that really brought tears to the eyes was when he finished singing the moving ‘Der Augen leuchtendes Paar’ and suddenly looked every inch like the frail father for whom life, or at least the best parts of it, are over.